El 11 de Enero de 1990 ArtFutura se presenta en el Mercat de les Flors de Barcelona. Un día antes, en la rueda de prensa, Eric Gullichsen ha mostrado un casco de Realidad Virtual y ha ofrecido a los periodistas la posibilidad de experimentar, por primera vez, la simulación de entornos 3D en tiempo real. ArtFutura comienza con un único espectáculo y un ciclo de conferencias. El espectáculo se presenta en el Mercat y consta de una proyección de una hora y una performance de treinta minutos titulada “Mugra”. Es el producto de la colaboración entre la artista californiana Rebecca Allen y La Fura dels Baus, que posteriormente evolucionará en una de las obras más completas de la Fura, “Noun”. Incorpora cuarenta pantallas de vídeo y crean potentes metáforas visuales sobre la relación hombre-máquina. El espectáculo audiovisual incluye trabajos ahora clásicos de animación 3D como “Knick-knack” de PIXAR y “Eurhythmy” de Susan Amkraut y Michael Girard, una animación que ha levantado una enorme expectación en Siggraph 89 por su sofisticada simulación de movimiento de grupos. También incluye “Capriccio” de Zbig Rybczynski, “Time” de Animàtica y una retrospectiva del artista japonés Yoichiro Kawaguchi. Muchas de éstas imágenes se muestran por primera vez en España. Al final de la proyección tiene lugar una actuación del artista Zush y su grupo Zush-Tres, que han preparado un vídeo especial para la ocasión. Las conferencias tienen lugar en el Instituto de Estudios Norteamericanos y en ellas participan el autor William Gibson, la artista Rebecca Allen, el científico Scott Fisher (NASA) y el inclasificable Timothy Leary junto a Luis Racionero, Xavier Berenguer y Eric Gullichsen. Quizás debido a la exigua comunicación, las conferencias son un fracaso de público, con apenas 20 personas en el auditorio. Lo que contrasta con el espectáculo del Mercat , que es un gran éxito de público y crítica. En total, ArtFutura cierra su primera edición con más de 5.000 asistentes. On the 11th January 1990, ArtFutura was presented in Mercat de les Flors, Barcelona. One day before the opening, in the press conference, Eric Gullichsen displayed a Virtual Reality helmet and offered journalists the possibility of trying it out in order to experience, for the first time, the simulation of 3D environments in real time. ArtFutura started as a unique spectacle and a cycle of conferences. The spectacle was present in the Mercat and consisted of a one-hour projection and 30-minute performance titled “Mugra”. It was a product of the collaboration between the Californian artist Rebecca Allen and La Fura dels Baus, which was later to evolve into one of the most complete works of the Fura, “Noun”. It incorporated forty video screens and created strong visual metaphors that concerned the relationship man-machine. 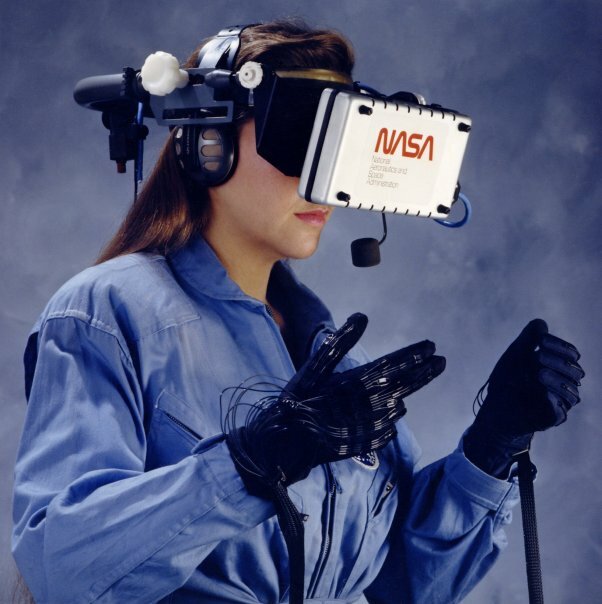 The audiovisual spectacle included works that are now classics of 3D animation such as “Knick-knack” from PIXAR and “Eurhythmy” by Susan Amkraut and Michael Girard, an animation that raised great expectations in Siggraph 89 because of its sophisticated simulation of group movements. It also included “Capriccio” by Zbig Rybczynski, “Time” from Animàtica and a retrospective of the Japanese artist Yoichiro Kawaguchi. Many of these images were shown in Spain for the first time. After the projection, there was an intervention from the artist Zush and his group Zush-Tres, who had prepared a video specially for the occasion. 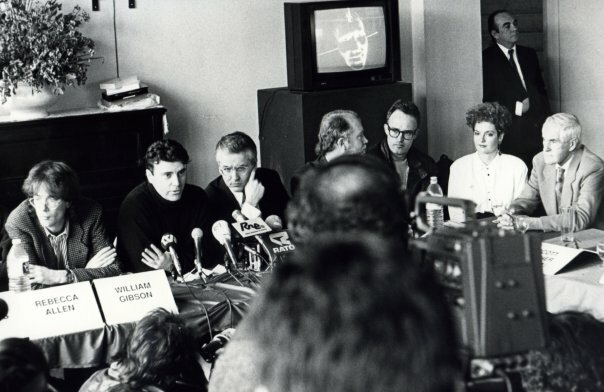 The conferences took place in the Institute of North American Studies with the participation of the author William Gibson, the artist Rebecca Allen, the scientist Scott Fisher and the unclassifiable Timothy Leary along with Luis Racionero, Xavier Berenguer and Eric Gullichsen. Perhaps due to inadequate communication, the conferences were a failure in terms of attendance, with hardly 20 people in the auditorium which greatly contrasted with the spectacle in the Mercat which was a great success as far as the public and critics were concerned. All together, ArtFutura finished its first edition having received more than 5,000 visitors. “The 1990 ArtFutura exhibition seems to me not only relevant, but also significant, almost symbolic… The cycle of some arts has ended, but other new cycles will begin. Perhaps by colouring a piece of material it becomes a highly esteemed handicraft, as with writing novels, making films or chiselling statues, but new art forms will emerge for each one whose cycle wanes”. Luis Racionero.